Adel, GA - Lights Out 10 brings the best small tire racers from around the world to South Georgia Motorsports Park this weekend for one epic event. Watch all the action LIVE brought to you by SpeedVideo. Cecil, GA - Jimmy Hidalgo Jr. raced his way into the final round in not one by two classes this weekend for the NHRA Lucas Oil Drag Racing Series at South Georgia Motorsports Park and took home the win in Stock Eliminator. Adel, GA - The Baddest Small Tire Race begins February 15th around 6 pm EST and runs through Sunday February 18th. Click Here for Live Coverage! 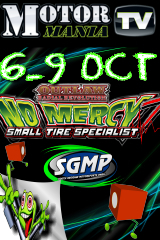 Adel, GA - No Mercy 8 features the wildest small tire racing action in the country as Donald Long's Circus rolls into South Georgia Motorsports Park this weekend. Racing action begins Thursday morning and continues through the weekend. CLICK HERE for Live Coverage! Cecil, GA - David Rampy scored the elusive double-up at this weekend’s NHRA Southeast Division Lucas Oil Drag Racing Series event at South Georgia Motorsports Park taking home the trophy in both Comp Eliminator and Super Stock. Cecil, GA - 2017 Kick's off this weekend with the New Year Nationals at SGMP. Super Pro, Bottom Bulb and Juniors are all on the schedule. Racing action begins Friday Morning 8:30 EST right here on DRR. CLICK HERE for Live Coverage! Cecil, GA - No Mercy 7 Small Tire Specialist brings some of the wildest racing action to South Georgia Motorsports Park this week. Coverage begins Wednesday around 1pm EST and continues through Sunday. CLICK HERE for all the Racing Action. 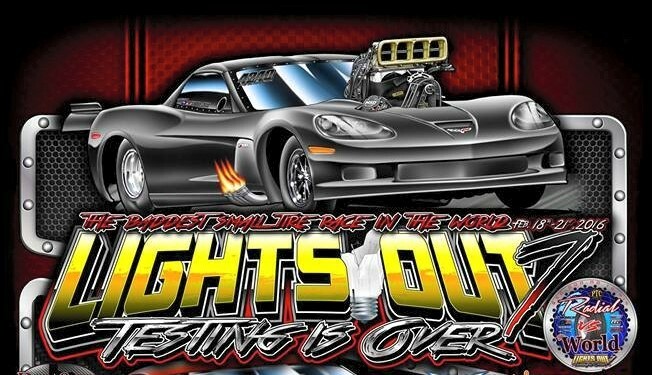 Adel, GA - Lights Out has become "The Baddest Small Tire Race in The World" according to promoter Donald Long, and DRR tends to agree! Watch the LIVE COVERAGE by MMTV all weekend long right here on DragRaceResults.com - Coverage begins Wednesday at 6pm. 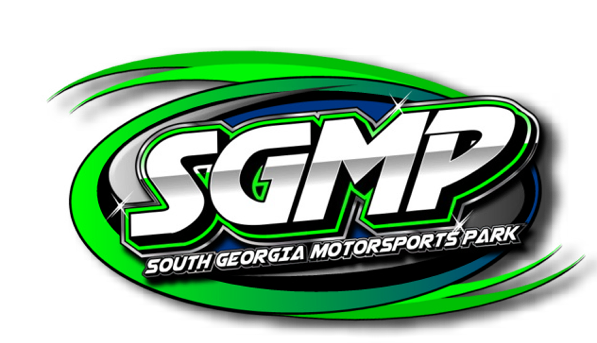 Cecil, GA - Live Coverage begins Friday morning from the New Year Nationals at SGMP in Cecil, Georgia. Click Here for the Live Coverage Video. 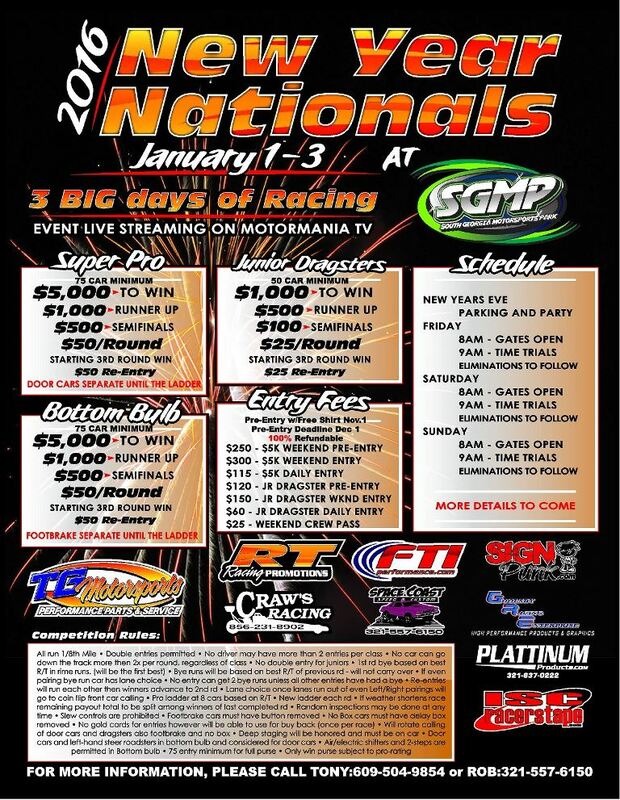 Cecil, GA - Big Bucks Racing kicks off 2016 with the Inaugural New Year Nationals at SGMP this weekend. 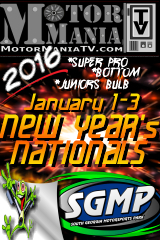 $5k to win in Super Pro and Bottom Bulb along with a $1k to win Junior race all 3 days. CLICK HERE for Race Flyer and More info.